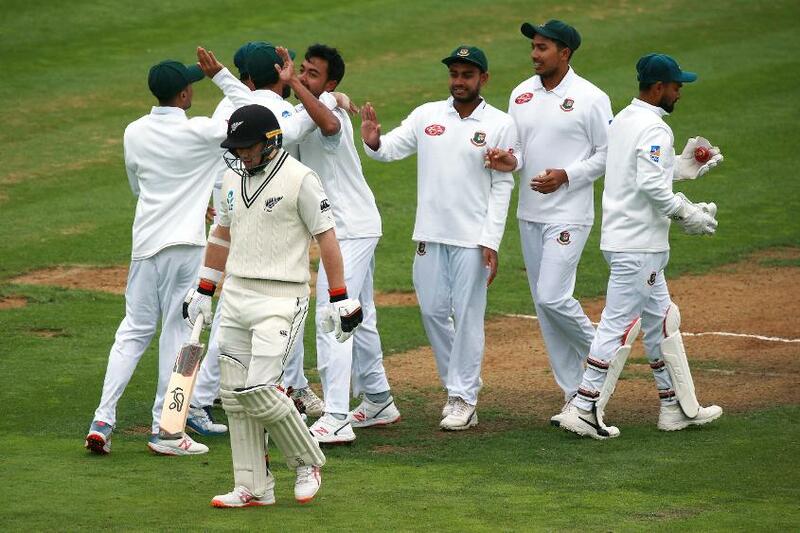 Play was finally possible in Wellington, after the rain relented a bit on Sunday, 10 March, making way for plenty of action in the 72.4 overs that were bowled, with New Zealand bundling out Bangladesh for 211 before being reduced to 38/2. However, rain returned late in the day to force early stumps, leaving the home side with a deficit of 173 runs to make up. If the pace of play is set to continue in this click, and if rain stays away sufficiently, there might yet be a result in this Test. Neil Wagner and Trent Boult might have a lot to do with that. Wagner returned a brilliant 4/28 – his second four-wicket haul this series – to puncture Bangladesh, and Boult’s 3/38 nipped out the tail, as Bangladesh folded in just 61 overs. Rain once again plays spoilsport in Wellington! Once again, it was a failure of their middle order after the openers had laid a platform. Tamim Iqbal and Shadman Islam put on a quick 75 for the opening wicket, with Iqbal once again looking extremely solid and full of intent, even as Islam supported him assiduously. However, the story was the same once the partnership was broken. Colin de Grandhomme forced Islam (27 off 53) to edge to first slip, and the rest of the batsmen failed to sufficiently build on the foundation. Wagner sent back Mominul Haque (15 off 38) and Mohammad Mithun (3 off 10) in quick succession. When he followed that up with the big scalp of Iqbal (74 off 114), Bangladesh were in all sorts of trouble at 134/4. They never really recovered thereafter. Soumya Sarkar (20 off 24) looked to hit his way out of trouble, picking up two fours and a six, while Mahmudullah (13 off 35) put away a couple of fours as well, but it was all ultimately futile as they struggled to build partnerships. Eventually, Taijul Islam and Liton Das put on a 38-run stand for the seventh wicket, with Das doing most of the scoring. But that proved to be just a brief break in the order of the day. When Boult trapped Islam in front for a 35-ball 8, the slide continued. The last four Bangladesh wickets fell for just five runs. However, their bowlers had something to cheer about when they returned to the field as Abu Jayed, the paceman, had the New Zealand openers – Jeet Raval and Tom Latham, centurions in Hamilton – dismissed for 3 and 4 respectively. New Zealand were a bit shaken, but Kane Williamson (10*) and Ross Taylor (19*) had initiated recovery, putting on 30 for the third wicket, when rain reappeared to put an end to the day’s proceedings.